dismantling process. With today’s pressure to underbid competition, many people are wondering if those cost savings mean a compromise of safety on the job site. 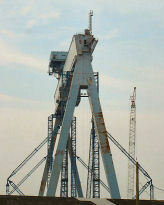 At the Fore River Shipyard in Quincy, MA, a giant crane needed dismantling. As is customary, specialty contactors were brought in for the task. Norsar LLC was hired to oversee the process and they subcontracted Sarens to operate the jacking system necessary for the dismantling process. OSHA issued citations for serious violations to both of these companies. The problem, OSHA representatives say, is that the companies deviated from their original plan and then did not adequately work out the new plan, placing many employees in danger. Originally, the companies planned to dismantle the crane’s 160-foot leg units in two 80-foot parts. Instead, they opted to work with the full 160-foot units, exposing employees to crushing-by and struck-by hazards. Additionally, they failed to minimize employee presence in the danger zone. A third company, Daniel Marr and Son Co., also received a citation for exposing workers, who were near water, to drowning and fall hazards. As a result of the crane crash, 28-year-old Quincy resident Robert Harvey died, leaving behind his wife. While the companies have been issued fines, Norsar’s being the largest at $35,000, many wonder how these safety oversights could have happened in the first place. Unfortunately, hundreds of preventable accidents, like this one, occur each year. The personal injury and wrongful death attorneys of Breakstone, White & Gluck, P.C. have extensive experience working on construction site accident cases, including crane accident and scaffolding accidents. If you’ve been involved in a construction related accident, please contact us for assistance.Consultations are always free and an attorney will answer your questions. Call 800-379-1244.